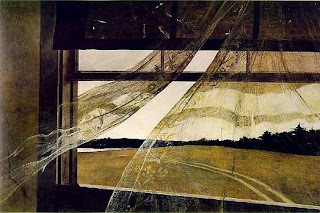 Andrew Wyeth died today--one of my favorite artists. About a year ago Kristie and I were able to see the Wyeth show at Atlanta's High Museum. 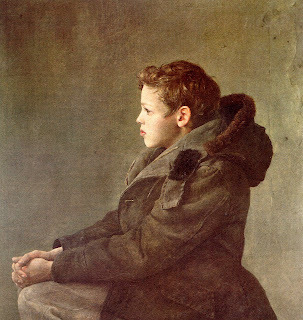 Andrew Wyeth is part of the Brandywine School of artists... Father to Jamie Wyeth, Son of N.C. Wyeth (who was taught by Howard Pyle). Which is a lovely spectrum of evolution from illustration to fine art (Pyle on one end, Jamie on the other, Andrew right in the middle). 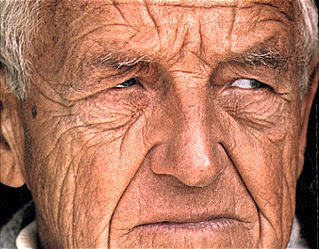 Andrew's position in contemporary art was awkward at best. Not classically illustrative enough to be as championed as his father, not a artsy as his son--but clearly a sort of bridge between the two. I think it's something in me that favors the transition over destination. It's why I think The Bends is Radiohead's best album. My work both in Undergrad and Grad school was in some part inspired of Wyeth's Helga series--an interesting event in art history for sure. 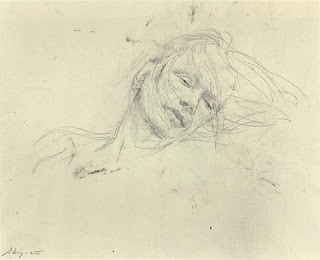 His drawings are much stronger to me than his painting; drawing and watercolors he would dash off during a session, taking little care of them--almost as records of his observation, but not individually important. This looser approach to imagmaking beget more free and lively pieces compared to the dullness of his belabored egg tempra paintings (his most noted work) which would often take him more than 6 months to complete. 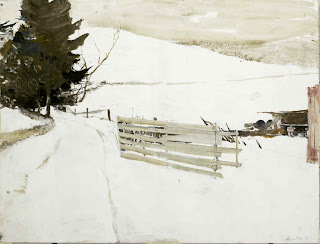 I will be bringing all of my Wyeth books (7--which the most non-comics artists collection I have) to school on Tuesday if anyone wants to get a better look at his work. I got to see the Helga exhibition when it came to Charlotte a few years ago. It was pretty amazing just how intimate those pieces felt. The pencil sketch was lovely as it is mysterious - I am not sure what emotions were present, it would have been nicer if you continued it. Amiable fill someone in on and this post helped me alot in my college assignement. Thank you on your information.